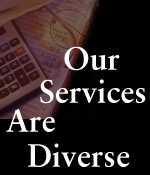 Working with our clients on acquisition and divestiture decisions. We are often able to provide management with information and reporting to assist in these decisions. Budgeting, including budgets for operating results, cash flow, capital expenditures and personnel. System design and implementation. Our personnel are experienced in assisting management with decisions on accounting organizations and systems, cost reduction programs and computer operations. Planning for the most advantageous business entity type (partnership, corporation, joint venture, sole proprietorship, etc.) We have worked with clients in many different industries in structuring entities to achieve the objectives of the owner or owners.